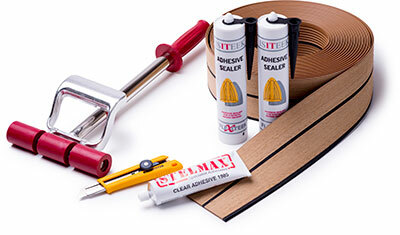 To build and install 1m² of Isiteek you need 2 package of Isiteek Adhesive Sealer and 1 package of Stelmax. Technical Data: All boxes are delivered with 2m² of Isiteek per box. The 2×45 PB comes as a double plank with a tongue and groove system ready to be glue together. The co-extruded caulk line is black and goes through the material thickness. The profile is 90mm wide and consist of 40mm plank, 5mm caulk line, 40 mm plank and 5mm caulk line. The 60 MB shall be used if you prefer to have a margin board surrounding your panel. The 60 MB ha a black co-extruded caulk line and can be bend to certain radius but if it is to sharp you must use the 125 KP. The 60 MB is 60mm wide and consist of 55mm plank and 5mm caulk line. The 2×45 PW comes as a double plank with a tongue and groove system ready to be glue together. The co-extruded caulk line is white and goes through the material thickness. The profile is 90mm wide and consist of 40mm plank, 5mm caulk line, 40 mm plank and 5mm caulk line. The 60 MW shall be used if you prefer to have a margin board surrounding your panel. The 60 MW ha a white co-extruded caulk line and can be bend to certain radius but if it is to sharp you must use the 125 KP. The 60 MW is 60mm wide and consist of 55mm plank and 5mm caulk line. The 125 KP comes as a 125mm wide solid plank with no caulk lines and are used in areas where the 60MB/W can’t be used. The Stelmax is used to glue the Isiteek profile together to a panel. The Adhesive Sealer is used to glue down the Isiteek panel and to caulk areas where the 125 KP has been used. Each package consist 310 ml. Colors: black, white and grey. The Crane 333 roller is used to roll along the planks expelling the air, remove air bubbles and ensure even and total contact.